There are a number of file types supported by the UNIGINE assets system. This page contains a categorized list of these file types along with a brief description. Mesh is the basic unit, that consists of a set of polygons and is used to create geometry for worlds in a UNIGINE project. Some meshes can be animated, apart from a set of polygons representing its surfaces, such mesh has a hierarchical set of interconnected bones (a skeleton or a rig) which can be used to animate the vertices of the polygons. Another way to animate a model is to create morph targets (or blend shapes), these are "deformed" versions of a mesh, stored as a series of vertex positions. In each key frame of an animation, the vertices are interpolated between these stored positions. You can create 3D models, rigs and animations in an external modeling application (3DSMax, Maya, Softimage, etc. ), and then import them to your UNIGINE project via the Asset Browser. It is recommended to use FBX as an intermediate file format to bring your 3D models to UNIGINE. This format is supported by the most popular 3D editors: Autodesk Maya, Autodesk 3ds Max, Blender, Modo, etc. A 3D model or a scene created in an external 3D modeling application. It can contain static meshes, skeletal meshes, animations, morph targets, light sources, and cameras. Learn more about FBX import. A 3D model or a scene created in an external 3D modeling application and stored in DAE format (COLLADA). 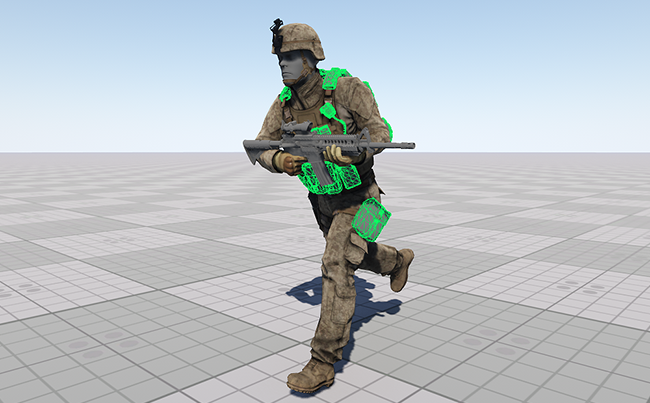 It can contain static meshes, skeletal meshes, animations, morph targets, light sources, and cameras. Import settings for DAE files are the same as the ones used for FBX import. A 3D model or a scene created in an external 3D modeling application and stored in 3DS format (3D MAX). It can contain static meshes, skeletal meshes, animations, morph targets, light sources, and cameras. Import settings for 3DS files are the same as the ones used for FBX import. Static polygonal geometry stored in OBJ format — namely, the position of each vertex, the UV position of each texture coordinate vertex, vertex normals, and the faces that make each polygon defined as a list of vertices, and texture vertices. The file format is open and has been adopted by other 3D graphics application vendors. If you want to import your 3d model with all materials assigned, you should import all corresponding material library assets (*.mtl files) either prior to importing the *.obj file or together with it. Built-in file format, that describes static and skinned geometry. It supports multiple surfaces and variable number of morph targets (blend shapes) for each surface, as well as multiple named animations stored in the single file. Built-in file format, that describes skinned animation. It is used together with *.mesh file that contains a bind pose. Thus, you can have a single skinned mesh (*.mesh) and multiple animations for it. Textures are images that are commonly used in materials. When a material is applied to a surface, textures are mapped to it. They can be either applied directly, as albedo textures, for instance, used as masks, or the values of the texture's pixels can be used for other calculations. Textures can also be used directly, e.g., as environment cubemaps, or to draw a projection of a Projected Light Source. A texture mapped to a 3D mesh. Textures are generally created using an external image-editing application, such as GIMP or Photoshop, and then imported via the Asset Browser. Some textures, such as render textures, are generated by the UNIGINE Engine. They generally take some information from the scene and render it to a texture to be used elsewhere. Several textures can be used in a single material for different purposes. For instance, a material may have an albedo texture, an ambient occlusion texture, a normal map, etc. In addition, there may be a map for the Emissive and Roughness stored in the alpha channels of one or more of these textures. 8, 16 and 32 bit precision per channel. Image file stored in the Portable Network Graphic (PNG) format; contains a bitmap of indexed colors under a lossless compression; commonly used to store graphics for Web images. Image file stored in the JPG (Joint Photographic Experts Group) format using lossy compression. Image file stored in the TIFF (Tagged Image File Format) format using losless compression. File in (DirectDraw Surface) format, contains compressed or uncompressed image data, which is optimal for GPUs. Image in raster graphic file format designed by Truevision; supports 8, 16, 24, or 32 bits per pixel at a maximum of 24 bits for RGB colors and 8-bit alpha channel. Image file created by Adobe Photoshop, a professional image-editing program; may include image layers, adjustment layers, layer masks, annotation notes, file information, keywords, and other Photoshop-specific elements. High Dynamic Range image. These are most commonly used for environment maps. Image file stored in the PPM (Portable Pixmap) format. Image file stored in the SGI (Silicon Graphics Image) format. To learn more about importing textures, see the Texture Import Guide. Material defines how the surface, to which it is assigned, will look like: its interaction with lights, reflection parameters, etc. A material asset is generally linked to several texture assets. Built-in type representing a base material, from which other materials can be inherited. Learn more about the base material file format. Built-in type representing a user material inherited from the base one. Learn more about the user material file format. Material template library MTL file, that stores description of materials for 3D models in OBJ format. An *.mtl file should be imported together with a corresponding *.obj file referring to it. As UNIGINE uses its own material system, you should adjust other material settings manually. Either as mono or stereo files, compressed or not, they can be quickly imported into your project. In the table below you'll find types of sound and video assets supported by UNIGINE. Waveform audio file (mono and stereo). MP3 file type storing compressed audio data. Ogg Vorbis (or oga, Ogg Audio Profile) storing compressed audio data. Video file that uses the open source Ogg container format; may contain video streams that use one or more different codecs, such as Theora; can be played using a variety of media players. Scripts are an essential part of your project representing application logic. UNIGINE has its ows scripting language - UnigineScript. It is designed to make coding easy-to-use even for junior programmers and at the same time provide the most optimal Engine usage. Scripts are platform-independent and do not require compilation. Built-in type representing a header-file for a script written in UnigineScript. Built-in type representing a script written in UnigineScript. UnigineEditor allows you to save various presets - configurations of different settings (e.g. rendering settings, gravity, sound velocity, volumes of sound sources, etc.). This type of assets can be used to configure worlds within your project. Built-in type that determines a configuration of rendering settings for a world. Built-in type that determines a configuration of physics simulation settings for a world. Built-in type that determines a configuration of sound settings for a world. Built-in type describing a UNIGINE world (scene). One project can include several worlds. So, there is no need to create a separate project for each world. Created in the UnigineEditor. Learn more about the creating and managing worlds. Built-in type describing any Node (or a hierarchy of Nodes) of the UNIGINE's virtual world. Created in the UnigineEditor or at runtime via the code. Built-in type describing a property. A property is a "material" for application logic. It specifies the way how the object will behave and interact with other objects and the scene environment. Built-in type, that stores generation parameters used by the Landscape Tool to generate a TerrainGlobal object. Created in the Landscape Tool. Built-in type, that contains the sequence of the parameters animated with keyframes along the timeline. Created in the Tracker Tool. The font in TTF (True Type Font) format. As a raster font, it can be scaled to any size without quality loss or pixelation, and the stored image appears the same when printed as it does on-screen. You can use any existing TTF font or create a new one. The path is a spline along which an object can be moved. Such splines can be created, for example, in 3ds Max or via the API, using the Path class and then saved to the *.path file.